Weatherford rug repair shouldn’t be left to amateurs. After all, there are more than 64,000 variations of rug weaves. Many are centuries old, passed down from generation to generation in Far Eastern rug-making families. At KIWI, our Weatherford rug repair service technicians are trained to recognize and diagnose thousands of weaves and perform thousands of repairs suitable for the fiber, construction and pattern of the rug. We offer tailored repairs for Chinese rugs, Egyptian rugs, Indian rugs, Pakistani rugs as well as reweaving for all types of rugs including Dhurry, Berber, Olefin and area rugs. Part science and part art, quality rug repair and restoration is a complex service that should only be trusted to the best, most experienced professionals and a trusted company. KIWI has been cleaning and repairing home furnishings and flooring for more than two decades. That’s why you need KIWI’s Weatherford Rug Repair technicians on your side. KIWI’s Weatherford Rug Repairing techniques use the oldest, most time-proven methods for repairing worn or damaged rugs. 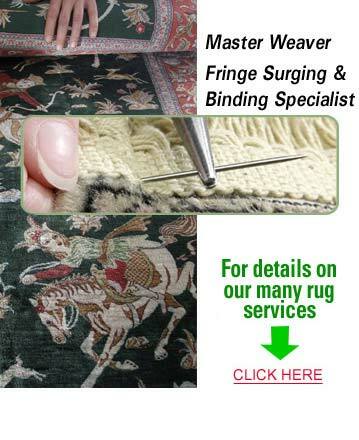 Call KIWI’s Rug Repair Service of Weatherford, TX today for an estimate.